Many equate the 1960’s with a “youth culture” revolution. The reality was much more complex, tie-dye notwithstanding. But few regard the early 19th century in similar terms. Perhaps things were more complex then too, at least in some ways. That earlier period saw another decorative ‘revolution.’ Potters, starting in Stoke-on-Trent England, used engobes in bewildering and previously unheard of ways. Acidic stains dripped onto wet slip created dendritic patterns. Multi-chambered slip dispensers made “cat’s eye” and “cable” patterns. Wet pots rolled in crumbles of colored slip, then left as is or smoothed out, created agate-like effects. There was also polychrome sponging. “Fan” patterns. “Scroddle” (marbled clay) inlay. Machine lathe notching. Sprigging. Feathering. Marbling. And more. Individually or in combination. 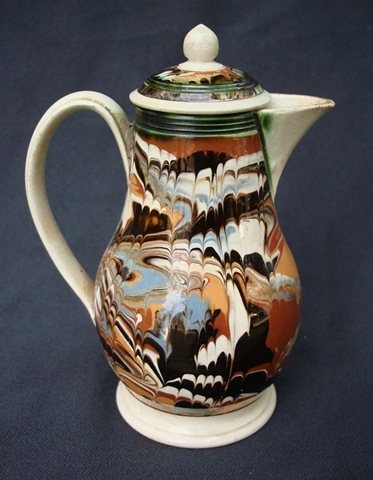 Contemporary accounts described this work as “Dipped Ware” or “Mocha Ware.” Regardless of the name, one would be hard pressed to find a time period that used slips as creatively or as daringly. Two curious trends get passing mention in Dipped Ware accounts. Skilled potters emigrated away (were fired) from Stoke, destined for the US and elsewhere. Due mainly to increasingly mechanized shop work. At the same time, and for the same reason, young men and women, many just teenagers, increasingly took their place. Adult designers (probably) worked out (many of) the techniques before turning the kids loose. Adults still made the molds and worked (many of) the lathes. But increasing numbers of youth worked in several areas of production, particularly decoration. What was the social fall out of this sea change? How must skilled tradesmen have felt to suddenly find themselves redundant? And replaced by who? Neighborhood kids! And what about those kids? It was borderline slavery to be sure. Grueling physical labor, interminable hours. But ample diary entries (from young laborers on these shores, at least) also attest to the factory lure. Kids got off the farm, away from the house. They could work in a building full of their peers and earn their own money. And the product they churned out swept all before it with its flamboyance, its price (pennies), and its massive scale of production. Mocha became a gold standard in pottery for years. Mocha and Related Dipped Wares, 1770-1939. Jonathan Rickard. University Press of New England/Lebanon, NH. 2006. The Reshaping of Everyday Life: 1790-1840. Jack Larkin. Harper & Row/NY. 1988. You are currently browsing the archives for the dipped ware category.